The Sooners are in the worst of situations right now. After that narrow, frustrating loss to Texas, they no longer control their own destiny. They sit sixth in the playoff standings, so if Clemson, Notre Dame and Michigan win out it would be tough for them to make it back into the playoffs - and that's assuming that Georgia loses to Alabama. All Oklahoma can do right now is win as impressively as they can and hope for the best. And their first priority is not to look past this rivalry game against a reeling foe or the hapless Jayhawks as they look forward to that West Virginia game that closes out, and will likely define, their season. If the Sooners are near their best, this isn't a fair fight. But if they take their eyes off the ball it could be, well, bedlam. This game is proof that scheduling is tough. It was moved from the last weekend, when it is traditionally played, in large part to avoid a potential rematch a week later in the Big 12 title game. In its place Oklahoma plays West Virginia - who they are all but certain to play again a week later in the championship. This is a very different game than the 62-53 insanity of last year. That featured Baker Mayfield against Mason Rudolph in a show of incredible QB strength on both sides. Oklahoma hasn't missed too many beats in the transition to Kyler Murray, but the Cowboys are a mere shadow of what they were with Taylor Cornelius in charge. But it would be easy to overstate the struggles of this offense. In fact, the offense is tenth nationally in total yards and Top 20 in both passing yards and scoring. But while they have been better than many think on offense, what they have lacked is consistency. They have scored at least 31 in seven of nine games and at least 42 in five of those games. But in the other two they scored just 17 against Texas Tech and only a dozen against an underwhelming Kansas State squad. At their best they could make this interesting - you certainly can't call this Oklahoma defense elite. But it is very tough to trust that we will see their best. Oklahoma not only has a better, deeper offense, but a far more consistent one. The only time we have seen them falter was against Army, and that game was just too weird to get worried about. In their last three games they have scored 52, 51 and 51 points, respectively - productive and consistent. If Oklahoma State fans were looking for a reason for hope, it would be that Murray is coming off his worst game, throwing two picks after having just three in his first eight games, and having the lowest completion percentage of the year - and that was against a Texas Tech team that ranks 125th nationally in passing yards allowed. But that game was far more of a blip than a trend, and it's not like the Cowboys are in any way a great defense. The game opened with the home team favored by 17.5 points, and that has climbed up to 20 points, with 20.5 now showing up in a few spots . About 60 percent of bets have been on the Sooners, so the movement is consistent with expectations. The total opened at a sky-high 76.5 and has climbed further - it now sits at 79. The Cowboys are just 2-5 ATS in their last seven road games and 1-4 ATS in their last five games in November. 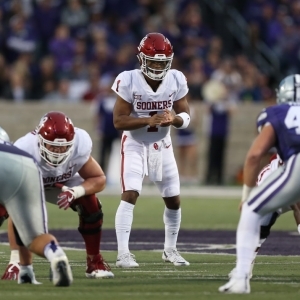 The Sooners are 14-5 ATS in their last 19 at home but just 1-4 ATS in their last five against teams with winning records. Oklahoma has covered in four of the last five meetings between the rivals and five of the last seven at home. Oklahoma is going to get their points. I have no doubt of that. They are in stride, and confident. But they don't excel at defense, and the Cowboys are fairly capable. Oklahoma is better and at home, and they should absolutely win. However, the Cowboys could score as well. With a spread this big, I just don't trust that the Sooners will run away with it. But I also don't trust the Cowboys enough to bet them. With one great offense and one solid one, and two underwhelming defenses, the much better play is the "over". It's a crazy number, but they scored 114 last year, so perhaps it's not crazy enough. Over it is.